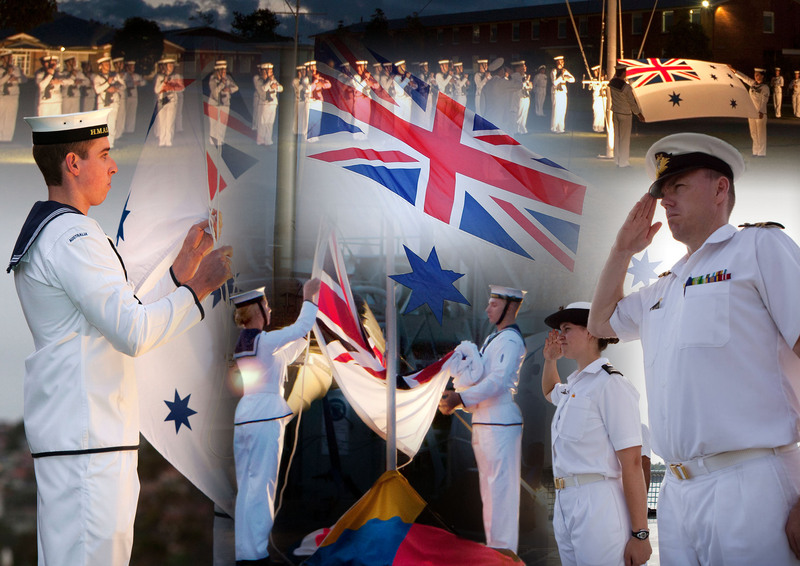 All Royal Australian Navy (RAN) commissioned ships and shore establishments wear a suit of colours which normally comprises the Australian National Flag (ANF), the Australian White Ensign (AWE) and a commissioning pennant. In a warship the ANF is flown from a ‘jackstaff ’ situated in the bows of the ship. The AWE, colloquially referred to as simply the ‘ensign ’ is flown from an ensign staff located on the quarterdeck or at the aft end of a ship’s flight deck. A commissioning pennant  is flown continuously from the masthead throughout a ships commission. A ship wearing this suit of colours is referred to as being a ‘private’ ship. When a senior naval officer, who is entitled to fly a distinguishing flag  or broad pennant , is present in an official capacity, or exercising command in a RAN ship or establishment, the commissioning pennant is displaced. On those occasions, that personage’s broad pennant or distinguishing flag is flown in lieu. A warship wearing this suit of colours is referred to as a ‘flagship’. 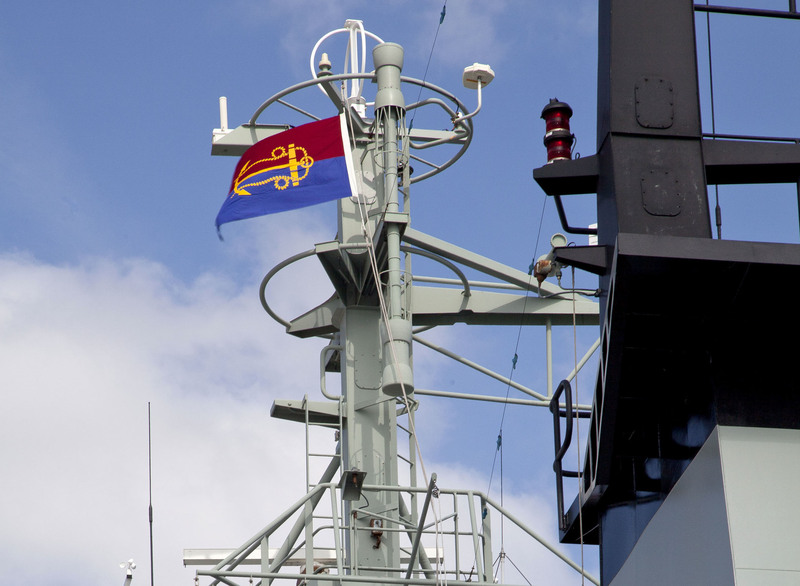 The Chief of Navy's distinguishing flag flying in lieu of a commissioning pennant to denote his presence while sea-riding in an Armidale class patrol boat. Traditionally the practice of hoisting and lowering the ANF and AWE is conducted in ceremonies known as morning ‘Colours’ or evening ‘Sunset’. The ceremonies are conducted in commissioned shore establishments, in ships alongside in harbour and by those moored to a buoy or at anchor. Ships at sea do not observe the custom. Instead, they continuously fly the AWE from a gaff on the mainmast. In Australia the ceremony of ‘Colours’ takes place at 08:00 daily and involves marks of respect being accorded to the raising and lowering of the ANF and AWE by designated duty personnel. Five minutes before 08:00 a pennant, known as the preparative  is hoisted on the foremast to indicate ‘five minutes to 8 o’clock’. On observing this, a report to that effect is made to the Officer-of-the-Day (OOD ) by duty watch personnel. At one minute before 08:00 the preparative pennant is shaken to alert those involved in the ceremony to come to attention. At 08:00 the preparative pennant is dipped and the report ‘8 o’clock Sir/Maam!’ is made to the OOD who responds with the order ‘Make it so!’ The ships bell  is then rung eight times in a cadence of 4 x 2 strikes and the ‘still’ piped on a boatswain’s call . The ANF and AWE are then raised before the ‘carry on’ is piped and the ceremony completed. The time of ‘sunset’ is determined by the setting of the sun as promulgated in the Nautical Almanac. The ceremony is similar to that of ‘colours’ although the ship’s bell does not feature in proceedings. Five minutes before ‘sunset’ the preparative pennant, is hoisted on the foremast to indicate ‘five minutes to sunset’. On observing this, a report to that effect is made to the Officer-of-the-Day (OOD) by duty watch personnel. At one minute before sunset the preparative pennant is shaken to alert those involved in the ceremony to come to attention. At sunset the preparative pennant is dipped and the report ‘Sunset Sir/Maam!’ is made to the OOD who responds with the order ‘Pipe the still!’ The ‘still’ is duly piped on a boatswain’s call and the ANF and AWE lowered. On completion of the ceremony the ‘carry on’ is piped and duty personnel dismissed. Did you know that vexillology is the scientific study of the history, symbolism and usage of flags or, by extension, any interest in flags in general? On special occasions the ceremonies of ‘colours’ and ‘sunset’ may be conducted in the presence of a naval guard and band. When this occurs the guard is brought to attention and the ‘general salute’ made while morning colours are raised to the musical accompaniment of the first verse of the Australian Nation Anthem, Advance Australia Fair. The AWE and ANF are raised in time with this musical score. When full ceremonial is accorded for the lowering of colours it is known as ‘Ceremonial Sunset’. In shore establishments, and those ships fitted with flight decks, it is often preceded by a 'Beat to Quarters ', a practice that dates back centuries to the age of sail when a ship’s drums were beaten to summon men to quarters or action stations when battle was imminent. Today the inclusion of Beat to Quarters honours the courage and sacrifice of the men and women of the Royal Australian Navy through more than a century of service during war and peace. Following Beat to Quarters the drummers retire to the band and the guard advances to commence the age old naval tradition of saluting the lowering of the Ensign at sunset each day. At five minutes to Sunset, the Evening Hymn, 'The Day thou Gavest Lord is Ended' is played. A volley of shots is fired by the guard during the rendering of this hymn which echoes a very old practice of saluting the knell of parting day. 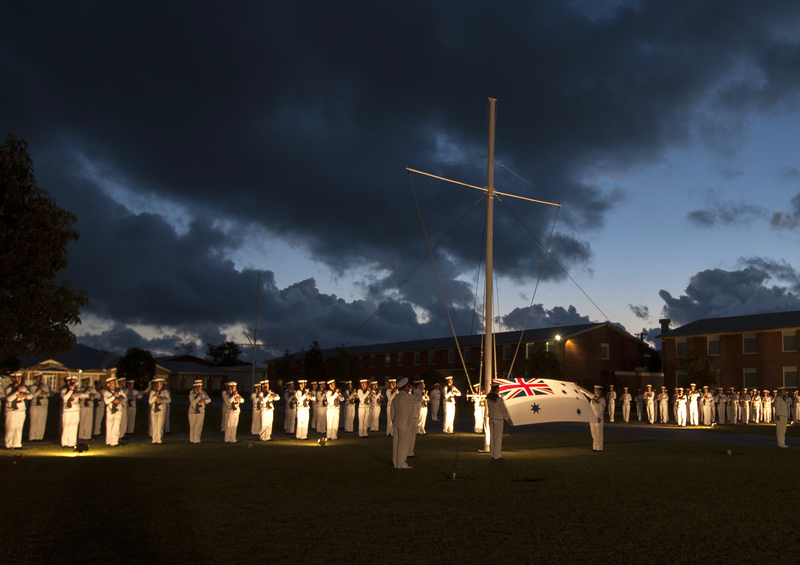 The tradition of ceremonial sunset being observed at the RAN Recruit School, HMAS Cerberus. ↑ The term ‘Jack’ has its origins in the Royal Navy. It was the name given to the Union Flag which in the 1800s was flown from a staff on the bowsprit of HM Ships. Hence the term ‘jackstaff’. ↑ Ensign - From the Anglo-Saxon 'segn'. A large flag or banner, hoisted on a long pole erected over the stern and called the ensign-staff. ↑ A long, white pennant displaying a red St Georges cross against the hoist. The pennant is flown from the main masthead from the day a ship commissions until she decommissions. It is only displaced by Royal Standards or a naval distinguishing flag or broad pennant. ↑ Distinguishing flags are flown by a person so entitled to denote his presence in a ship, boat, vehicle, place or establishment. Certain RAN appointments for rear admirals and above are entitled to fly these flags. ↑ A broad pennant is distinguishable by its triangular shape with a ‘V’ shaped ‘swallow tail’ cut in the fly. In the RAN certain commodore appointments are entitled to fly this pennant. ↑ The preparative pennant comprises a yellow field divided horizontally by a green band. In harbour its use is associated with the ceremonies of Colours and Sunset. ↑ The officer entrusted by a Commanding Officer with the safety of the ship in all its aspects while alongside in harbour. ↑ A ship’s bell is normally mounted on the quarterdeck or the flight deck of HMA Ships. It is inscribed with the name of the ship and the year of commissioning. It features prominently in the ceremony of ‘Colours’ and is often used as a font when baptisms are conducted onboard HMA Ships. ↑ Piping is a naval method of passing orders. In days gone by many of these orders were passed by use of a whistle known as a ‘Boatswain’s call’ or ‘pipe’. The ‘still’ is a high pitched, constant tone of 8 seconds duration. The ‘carry on’ begins with a high-pitched tone of one second followed by a low tone of one second duration. ↑ Beat to Quarters - the order for a drummer to summon every one to his respective station. Beat to Arms - the signal by drum to summon the men to their quarters.